With global expansion of the Internet of Things (IoT), demand for IP/Ethernet-connected devices is soaring. Billions of devices are already capable of connecting to the Internet. Ethernet—and power-over-Ethernet (PoE) in particular—has grown in popularity because it strikes the perfect blend of speed, cost, and ease of use. 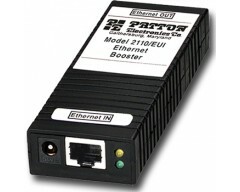 The CopperLink 1101E kit from Patton enables Ethernet connectivity over previously installed copper infrastructure. The solution breathes new life into circuits previously deployed for such traditional non-IP applications as RS232/485 HVAC and building automation controls, alarms, CCTV, analog phones, intercom speakers, and others. Instantaneously install PoE-capable devices such as wireless access points (WAPs), IP cameras, IP telephones, IP door stations, HVAC controls, LED lighting and more—with no additional overhead cost. With the extended reach the CL1101E kit provides, you can install your IP terminal equipment exactly where you want it! Flexibility of device location is paramount in such applications as building security, where increased perimeter dimension and expanded spot coverage area are critical.